James Brown’s daughter and one of his former assistants rolled through the streets of his hometown Thursday, worried about Masters traffic. They mostly focused on Deanna Brown-Thomas’s little Maltese, named Sweetie, currently at the vet’s office, awaiting emergency transport to an animal hospital in Columbia, South Carolina. Thomas had accidentally backed over the dog, and her voice lowered when the phone rang, bracing for bad news. That reminded her of the time her dad had done the same thing to a family pet, which brought on a run of stories, including the one that’s got them laughing now, interrupting each other. It’s about the time James Brown went to the Masters. Or, rather, past it. Five or so years before he died in 2006, Brown was driving home from dinner at Michael’s on Washington Road during Masters week. This was James Brown, who had a full hair salon in his country estate, so the car he drove down Washington Road was a gleaming, sky blue Rolls-Royce. When he arrived near Magnolia Lane, he slowed down, and the fans leaving the grounds found themselves face-to-face with the Godfather of Soul, James Brown, with that luxurious mane of hair he kept in place with white cans of generic hair spray. “People went crazy,” the former assistant, Elif Crawford, said. He hammed, loving the attention, then sped off. That’s about as close as he wanted to get to the circus around the National during Masters week. The tens of thousands of people who pack the hotels and suburban neighborhoods each spring don’t ever go to the Augusta where James Brown grew up. A downtown tavern called The Soul Bar, decorated in late Godfather, was as close as I’d ever been to James Brown’s Augusta, even though I’ve been coming to this city for 10 straight years. On Thursday morning, I met Deanna. We walked through the Augusta Museum of History, stared at a picture of her with her dad on Soul Train. They wore matching suits. She was 3. The executive director told me James Brown was the first African American musician to insist his face be on album covers. The museum she runs follows his life. The broken family, shining shoes on Ninth Street, his Aunt Honey’s brothel. That’s where he learned to dance. The customers threw pennies at his feet. Dimes if he got lucky. She drove down James Brown Boulevard, which is what they renamed Ninth Street. There’s a Church’s Chicken at the corner of James Brown and Laney Walker. James Brown loved to go in and eat there. Folks called this The Terry. The Territory. Boards covered up windows, and an old house was the color of smoke, the paint decades into a peeling. People gathered on corners. She turned onto Twiggs Street, going the wrong way at first, trying to see if the numbers were rising or falling. Where was 944? “What I come through the hood for?” she said, laughing. She turned around and found the old brothel. It’s a church now. A cross marked the door. The walls looked concrete, like it was a bomb shelter. It seemed abandoned. She headed west, to the house where she lived as a little girl. It’s on Walton Way, tucked into a row of mansions. She said the Browns were the first black family ever to live on The Hill. The homes are white and look built for “plantations.” Some seemed rented for the Masters. A lot had Masters flags flying in the yard. A doctor lives in their old house now, but she pulled into the driveway anyway. She said she’d play lost if someone came out. The little guardhouse Brown built is still tucked into the front left corner by the drive. The house, a brick split level, is hidden behind the leafy front yard. Brown used to decorate it for Christmas. The kids came from The Hill to see, and they came the five and a half miles from The Terry, too. There was a cloud over this week, as there has been every week since he died. When James Brown’s heart stopped on Christmas Day 2006, his vast fortune, much of it in still-unearned royalties, went into a trust to pay for education for poor kids — kids who’d grown up rough like him. That’s what his will stipulated, and that’s what he wanted, according to his longtime attorney Buddy Dallas. But when Brown died, everyone sued everyone. A gripping GQ story by Sean Flynn from three years ago chronicled every twist and turn. But basically, to use some official legal jargon, the thing turned into an unholy shitshow. There are now four dozen (or more) lawyers fighting over James Brown’s money, with his six children wanting part of the fortune, with other kids popping out of the woodwork, claiming paternity. Deanna Brown-Thomas is part of the group contesting her father’s will. Simply put — certainly too simply, in the opinion of the litigants — the legal system in South Carolina seems to be siding with the family instead of with Brown’s will. People on both sides have strong opinions, and family relationships, especially when money is involved, are much too complicated for quick judgment. It almost doesn’t matter who’s right, as long as you’re not a poor kid who wants an education, because while many facts can be disputed, one cannot: There are men in suits cutting deals, rolling up hundreds — thousands? — of billable hours. There are 50 lawyers counting their time. James Brown lived in a whorehouse as a child, and, in some ways, he never really escaped. If the nostalgic, conservative, tinkling pianos on the Masters television promos tell a story about the club and the men who run it — about the rich, powerful Augusta — Brown’s music tells a story about Brown and the struggle on his side of town. The horns grunt, the rut of Saturday night and the soar of Sunday morning, drums steady against rising and falling melodies, the attitude, the pride, the pain. His music tells more about him than driving down an old street or pulling into the driveway of the mansion he bought on the fancy side of town. Watch him play “It’s a Man’s Man’s World” in Switzerland in 1981. Sweat pours down his cheekbones and drips off the gold necklace around his neck. The camera focuses on him, but the music behind him seems somehow controlled by his dipping shoulders and shaking head. The trills of the guitar, the power chords and cymbal crashes, the stops, the starts, the incredible building noise that both pushes and pulls the show. The dancers sway, diaphanous and teasing, subtle hip shakes and arm rolls. The stage behind Brown is filled with moving shadows, sliding in and out of the forest of microphone stands and flashes of brass. The band. They followed him around the world, and on the good nights they felt like the most swaggering badasses ever. The last iteration of the band had 22 players, by former member Roosevelt Johnson’s count — and when Brown died, they scattered. They’re in Georgia and Florida, California and New York. Roosevelt washed up back home in Cleveland, and his phone didn’t ring. He lost his cars. He struggled to pay $70 a month to AT&T for his phone. Nobody wanted James Brown’s band. They got together to play an event for Don King in 2007, and he said, wistfully, that they haven’t all been together since. R.J. keeps an old bottle of Brown’s Viagra, a few of his silk shirts, some pajamas. He stores the names and numbers of the silent band in his telephone. Often, he scrolls through just to remember. Some are listed by their full Christian names. Tony Cook, drums. Others go by what Mr. Brown called them. The Blaster, on rhythm guitar. Doogie Howser on lead. Fred Flintstone, sax. R.J. is almost certain he’s the only person in the world who has everyone’s number. He keeps a copy in his laptop, one on a legal pad in his briefcase, and a third in a drawer. And, of course, in his phone. That’s the number promoters know. If James Brown’s last band has any future, it exists through R.J.’s phone. This January, with R.J. two or so months behind on his bill, the company disconnected it. “This line is being checked for trouble,” is what callers heard. Johnson went to his children and to his family members. They got the phone turned back on the next day. He said that the promoter has some dates lined up. Shows in Europe, the whole band. Paperwork, that’s the holdup. Things to sign. A couple more days, he said. Then the band can get back together. That first night, in either France or Austria, they’re gonna shake off the dust, breathing in and out, trills and power chords. Seething energy. “Doing It to Death” will be the first number. The contracts need signing. “In a couple of days,” R.J. said. Deanna Brown-Thomas drove me back to my car, parked at the Augusta Museum of History. Two banners hung on the outside. One for golf, the other for her dad. Inside, they’ve got a real green jacket on display, and statues of Masters winners, but the most popular exhibits, by far, are the rooms filled with James Brown’s clothes, guitars, his University of Georgia mug, the generic hair spray, the comb and Maalox. The Bible opened to his favorite Psalms. These things bring Brown alive for tourists, but they do not for Deanna. She senses his presence most through his music. There’s a kids group doing James Brown songs Friday night in downtown Augusta, at the statue the city erected in his honor. When the kids play and sing, he comes back. She wiped away a tear. “It’s just like the heavens opened up,” she said. There’s one song she’s been listening to a lot lately: “Georgia-Lina,” about his poor beginning. She’d like to play it for me. She pulled out her phone and called a local disc jockey. The DJ wasn’t in the studio. She called another. She wanted to hear this song. Maybe someone would play her father’s voice for her on the radio. She struck out with Chills and with Dot and turned into the parking lot of the museum filled with her father’s things, unable to summon his voice. I followed Broad Street out of Augusta, past the dirty strip clubs and pool halls. The genteel houses on the outskirts of downtown gave way to an industrial-rural moonscape of neon-green brush and one-story empty buildings labeled “available.” When he’d come home from town, he crossed the river near the stacks of the power plant and the rusted rail trestle. Beech Island, South Carolina, sits just over the state line, the cinder block barbecue joint and white clapboard shacks. The African Methodist Episcopal and the Missionary Baptist churches, like the one where James Brown learned he had a talent that none of the other kids had. The nearest little grimace of a town was called Spiderweb. James Brown lived not far from where the highway from Augusta crossed Atomic Road. A chain locked the gates to his land. Tall trees framed the driveway. Everything looked immaculate. The caretaker still comes to work every day. Nobody knows what’s going to happen with the lawsuit, so he keeps the place in order, just the way Mr. Brown liked. His name is David Washington. He was bent into the hood of a wine colored Town Car, working on the engine. His shirt, which said “James Brown Estate,” matched the Lincoln. He waved. I got a message right when the gate came into view. It was the booking agent in New York. I pulled over and returned the call. There were no scheduled gigs. There were none on the horizon. James Brown’s band was scattered and his home was empty, behind the wound coils of a silver chain. A sign resting on the ground hinted at the legal conflicts: “Anyone entering or leaving the premises will be searched.” The gate was iron with brick supports. The grass looked perfect. Taking care of the property is a full-time job. One day it might be like the Graceland of Soul, but for now, it stays locked. Washington mows, does odd jobs. When he finishes, it’s time to start again, his life a circle, caring for the home of a man who’s buried in Deanna’s yard three or four miles up the road. The blacktop road and the thick, green forests were quiet. Nothing, save the fading grandeur of the gate, suggested the noise and power, the sin and the salvation, born out of the man who once lived over the hill. 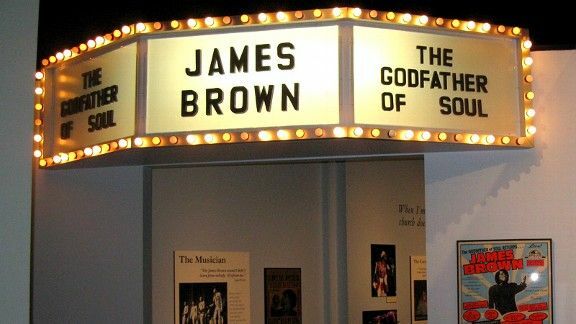 Some of James Brown’s things remain in the house. A car sits in the garage, its many-valved engine silent. The sky-blue Rolls-Royce, with South Carolina tags, needs a new fuel pump.